DialogLord of the Reload Mega Wasana, Sri Lanka’s most rewarding mobile-based lucky draw programme, commencedits latest edition last weekend unveiling a grand prize of Rs. 10 million every week. All Dialog mobile post and pre-paid customers are eligible for the draw, with every pre-paid recharge or post-paid bill paymentamounting of Rs. 50 or more. Customers will receive a maximum of five draw numbers per week based on the value of the reload, plus, an English letter when completing all 5 draw numbers. Customers matching all five draw numbers and the English letter of the week will win the grand prize of Rs. 10 million, whilst customers matching five draw numbers only will receive Rs. 1 million. Rs. 100,000 is on offer for customers matching four draw numbers, whilst matching three or less draw numbers will win prizes from Rs. 1,000 to Rs. 50. 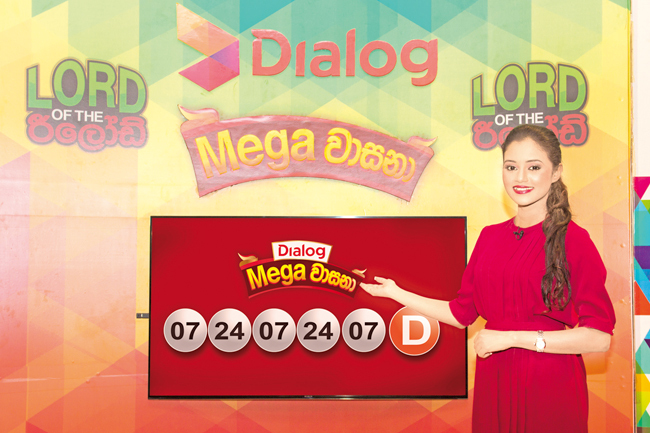 From 2015, Dialog’s Mega Wasana programme produced over 1.1 million lucky winners in just 63 weeks, the largest number for a mobile based lucky draw programme.The weekly draw is broadcast on ITN and Vasantham TV every Saturday at 7.55 p.m. and 9.55 p.m. respectively. Dialog mobile users can dial #121# or call 121 to check on the week’s winning numbersand redeem prizes. The programme has produced winners from all over the country, empowering and changing futures for thousands of Sri Lankans. Dialog’s Mega Wasana is the largest lucky draw programme in the country, designed to reward Dialog’s 10.5 million plus customers. Mega Wasana 2016 is billed to further its record-breaking run and reach during this year. Out of 30 draws I have not got a single number. Have no faith in your lottery.